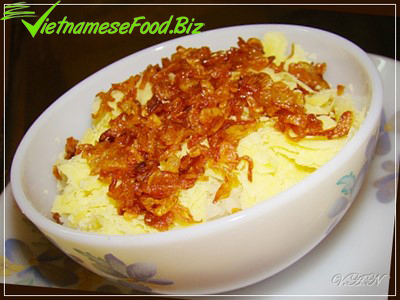 I have never seen any places in Vietnam with many kinds of good steamed glutinous rice like Ha Noi. Ha Noi "xôi" is really a diversified picture of agricultural products of Vietnam. They are "xôi gấc" (steamed glutinous rice with Momordica cochinchinensis), "xôi lạc" (steamed glutinous rice with peanut), "xôi vò" (steamed glutinous rice with split peas), "xôi đậu" (steamed glutinous rice with bean), "xôi ngô" (steamed glutinous rice with corn), "xôi cốm" (steamed glutinous rice with green rice flakes), "xôi dừa" (steamed glutinous rice with coconut), "xôi thịt" (steamed glutinous rice with cooked pork), "xôi chả" (steamed glutinous rice with pork pie), etc. Each kind of "xôi" is a real creative art and a wonderful combination of ingredients. Among these kinds of "xôi", I am the most impressive with "xôi xéo" since it is really special even with its name as "xôi xéo". "Xôi xéo" is normally sold in the morning at almost all alleys in Ha Noi. It is sold by peddlers who carry bamboo frames on their shoulder or ride a bike. No one knows when "xôi xéo" came into being in Ha Noi; however it has become a popularly special dish for breakfast. Students and workers enjoy this dish the most. It is quite understandable since it is cheap, gives feeling of fullness and it is easy to eat. No matter where you enjoy this dish in the city, its ingredients are the same with steamed glutinous rice, bean, fried onion, and liquid fat. "Xôi xéo" is good thanks to glutinous rice selection to make it glutinous without being much pasty. Bean is steamed, well-kneaded and rolled into big balls so that they can be thinly planed. Onion is fried and it must not be too brown. This dish must be soused with liquid fat which is clear and viscid. In order to keep it as liquid (not to be solidified) in Winter, liquid fat is always put on a brazier. In the morning, drop by a shop of steamed glutinous rice with lots of choices, seeing seller who skillfully make "xôi xéo", you definitely take it for your breakfast. A big bowl of "xôi xéo" may keep you full till late noon. If affordable, you may require seller to add some salted shredded meat. It only costs you VN3,000 to VND5,000 to enjoy that good dish for your breakfast.